MEMOFIN - Report to the European Parliament, the Council and the Commission on the budgetary implications of Regulation (EU) No 236-2012 on short selling and certain aspects of credit default swaps - L'information financière que vous ne trouvez nulle part ailleurs ! 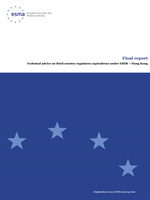 Article 47 of Regulation (EU) No 236/2012 of the European Parliament and of the Council of 14 March 2012 on short selling and certain aspect of credit default swaps (SSR) requires ESMA to assess the staffing and resource needs arising from the assumption of its powers and duties under the SSR and submit a report to the European Parliament, the Council and the Commission of these needs by 31 December 2012. This paper highlights the tasks that ESMA will need to carry out in view of its responsibilities under the SSR. For each task the report analyses the implications in terms of processes and activities to be carried out. It estimates the different processes that are expected to be followed and completed and it determines the resource implications that these will have. The European Parliament, the Council and the Commission are asked to assign the relevant resources from the EU budget in order to allow ESMA to perform its tasks under the SSR.